Harris Search Associates has recruited Dr. Verdat Verter as Supply Chain Management Department Chair at Michigan State University. 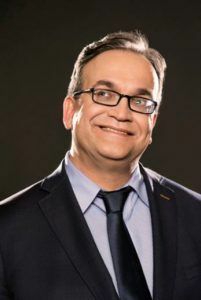 Vedat Verter, the James McGill Professor in Operations Management at McGill University in Montreal, Canada, will join the highly-ranked Department of Supply Chain Management as its next chairperson on July 1, Broad College Dean Sanjay Gupta announced recently. Verter is a top scholar in operations management and has held multiple leadership roles at McGill, including area coordinator (equivalent to a department chair), associate dean for research and founding director of several initiatives related to healthcare management. He is also a long-time director of McGill’s MD-MBA program, according to Gupta. Ranked #1 in US News and World Report, the Supply Chain Management Department (http://supplychain.broad.msu.edu/) is the home of internationally recognized faculty who are among the most accomplished scholars and teachers. The department offers a Bachelor’s degree in Supply Chain Management, an MS in Supply Chain Management, and Ph.D’s in both Logistics Management, and Operations & Sourcing Management. The department contributes heavily to the Executive and Full-time MBA programs, online certificate programs, and is very active in executive education programs. Founded in 1855, Michigan State University (msu.edu) has always been an innovator in research, teaching, and application of knowledge. In 1863, Michigan State was designated the beneficiary of the Morrill Land-Grant Colleges Act endowment, becoming the pioneer land-grant college in the United States and serving as a prototype for future institutions. From these origins, Michigan State has evolved into a comprehensive, global, world-class university with a full spectrum of programs and attracting a diverse set of gifted professors, staff members, and students. The University has been an elected member of the Association of American Universities since 1964. The Eli Broad College of Business has 125 full-time faculty in five departments: Accounting and Information Systems, Finance, Management, Marketing, and Supply Chain Management and one industry-specific unit, The School of Hospitality Business. The work of the College is supported by a 100-person administrative staff and 50 academic specialists. Currently, some 7,700 students are enrolled in the Broad College (approximately 6,700 undergraduates and 980 graduate and doctoral students), making Broad one of the largest business colleges in the country. The Broad College is consistently a top 25 business college in rankings. The Broad vision is to be the leader in creating knowledge and developing transformational thinkers and doers who make business happen. A core focus of the college’s strategic plan is on the 3Rs – Recognition for the Broad College is the result of the accomplishments of our world-renowned faculty, our students, and our alumni. From this we have built a Reputation for being one of the top business schools in the world, and this is reflected in our Rankings. Harris Search Associates - an IIC Partners member firm, is a leading global executive search and board advisory consulting firm with 50 offices in 33 countries worldwide. Our practice is focused on identifying and attracting leaders to support the growth of clients in the areas of research, science, engineering, academic medicine, and healthcare enterprises. Clients include the foremost universities, research parks, institutes, academic medical centers and healthcare organizations driving global innovation and discovery.